Did you know the Student Handbook is your annual contract with the College? The Student Handbook provides you with your rights and responsibilities as a student as well as links to important information that will help you make decisions about your academic and social success. Students are expected to read the Handbook in its entirety each year. Did you know there's a policy updates section? The Student Handbook is reviewed annually and completed in August for each academic year. While typically you will only see policy changes in August, the Policy Updates section is dated to show you the most recent updates divided between Academic Policies and Norms for Community Living and Policies. Did you know you can access previous versions of the Student Handbook? While students are responsible for following Student Handbook policies as changes become effective, students are responsible for following the academic program policies for their year of entrance into the College. Visit the Handbook Archives page to review academic policies from your year of entry into the College. Did you know there's a notes feature that you can use? 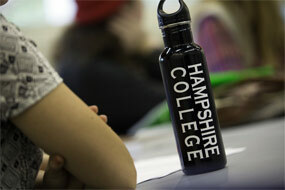 In the left side bar, log in using your usual Hampshire College log in information. Once logged in, a Navigation section will appear below the "Handbook Navigation" in the left side bar that allows you to "Add a Personal Note." Only you can view these notes and they will remain on the pages you save them on for your own personal use. Hampshire College reaffirms publicly its moral and legal commitment to a policy of equal opportunity in education and employment. Please click here for the full notice as well as the discrimination, harassment, and retaliation policy, how to report, and where to find support and resources. This document uses “they” and “their” in place of “he or she” and “his or her.” Though we acknowledge that this is not traditional English and sometimes sounds awkward to the ear, it is intentional. We seek not to use gendered pronouns, as doing so may exclude valuable members of our community. Hampshire College publishes its Annual Security Report and Daily Crime and Fire Log in accordance with the Clery Act and encourages all persons to report any criminal act or activity of which they may be aware. Accurate reporting of all crimes can help the College to identify crime patterns and support its efforts to reduce crime. We strive to ensure this publication is made as accurate as possible. Please refer to the Policy Updates section for up-to-date summaries of changes and specifically where to view individual sections that have been modified. While it is our practice to be transparent with students and the community, Hampshire College reserves the right to change and/or modify policies, processes, and procedure without notice. The office of student rights and responsibilities oversees publication of the Hampshire College Student Handbook, please direct any questions and feedback to the director at gansa@hampshire.edu.